Dedicated to all of Canada. Categories: fiction, Scecond Seat on the Right | Tags: Canada, Flash Fiction, Gord Downie, Long Time Running, micro fiction, mourning, music, Rest In Peace, sadness, scene, short fiction, The Tragically Hip | Permalink. Mum: Did you know your dad died in 1948? Me: No, Mum, it was 1978. I was born in ’64, so if he died in ’48, he wasn’t my dad. Mum: Oh. I’d better shut up then, before I get myself in trouble. 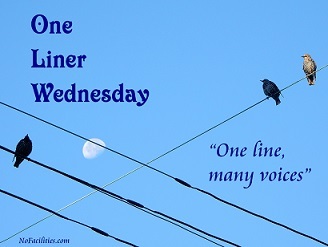 Categories: Blogging, Blogs, Life, One-Liner Wednesday, Prompt | Tags: #1linerWeds, aging parents, dementia, family, Humor, humour, inspiration, support, writing prompt | Permalink.